Investigation: How Does Temperature Affect Respiration Rates of Fish? Introduction: In this lab you will slowly change the water temperature of a fish and determine how changing the temperature affects the fish's respiration rate. Recall that HOMEOSTASIS refers to an organism's ability to respond to environmental changes and maintain its own internal balance. Step 1. Record the temperature of your fish’s water on the data table. Step 2. Count the number of breaths the fish takes at this temperature over 30 seconds and record on the data table. Step 3. Use an empty bowl and add cold, icy water. Place the fish beaker in the ice bath. Step 4. Watch as the temperature slowly changes. When it reaches each of the ranges in the data table, write down the exact temperature in the data table and record the number of breaths the fish takes. Step 6: Compare your data to the group sitting nearby and fill out the table for Fish 2. 2. Why was it important to place your fish in a water bath instead of changing the water temperature directly? 3. 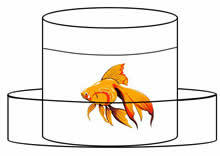 Goldfish can adjust to dropping temperatures much easier than they can to warming temperatures. Make a prediction based on your data about what would happen if you INCREASED the temperature of the water. Support your prediction with evidence from the lab. 4. 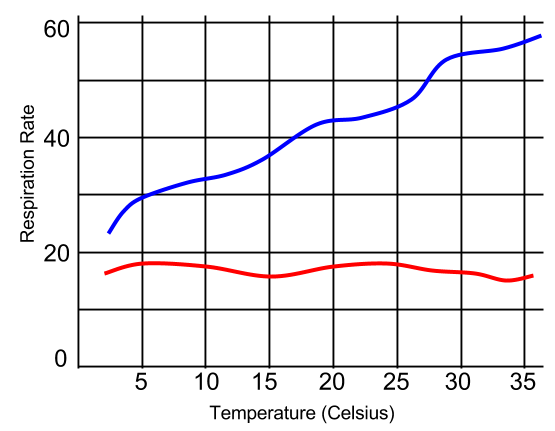 Indicate on the graph which line would represent the endothermic animal and which line would represent the ectothermic animal. Explain how you know this. 5. Design an experiment that will test how a fish's respiration rate is affected by light. Explain your design. You may wish to draw a picture of your set-up. Include how you will change the environment and what you will be measuring.